When I first met Kinga I couldn´t believe that this fragile-looking young woman was the same one I had seen performing on stage just a few weeks before. Her performance was so different from what I had expected that I knew I had to make an interview. Kinga Tóth (*1983 Sárvár, Hungary) is what I would call a „universal artist and researcher“, always trying to take a deeper and somehow painful look into the human mind and it´s relation to and it´s literally communication with the modern industrial world with all it´s machines and digitalized social systems. She is a (sound)poet-illustrator, video artist, songwriter & front woman of a punk band, communication specialist and copy editor of an art magazine, to name but a few. For her exceptional work she won a number of prices and Scholarships, such as the Queer Publishing House´s novel price 2012, the Solitude Scholarship Stuttgart 2013 or currently the Visegrad Literary Residency in Bratislava. CHASED: When did you start dealing with poetry/art? What was the trigger? K. T.: Right these days the first “evidence” has been published in Hungary. An editor of a magazine asked us to share our first poems we wrote. What I found I wrote in six and is about my grandpa, whom I have never known. It’s a quite sad one, but what was interesting for me, that the structure and the form of the poem is pretty strict. Nowadays I give myself more freedom. I remember I was a hyperactive little girl, began to speak very early, sang and drew and danced and found out stories very early and all the time I had this “seek” for presenting, showing it. So I guess it was all the time there (like in most of the children), I just let myself not to stop it. CHASED: When I saw your performance of All Machine on stage I thought: This woman wants her poetry to literally hurt. It was almost as if I could feel the sound not only in my ears but under my skin. Is that impression right? K. T.: To have an effect for all the senses is connected to the way how i understand “text”. Text is for me something alive, an organism, which has different forms, like written letters, visual contours, sounds, and a live existence – for example a performance. The sounds I produce sometimes hurt, this is really about to open the body for the right sound, to reach and communicate with the other. CHASED: In your statement you say that you want to show how human beings and machines „work and live together“. And that the perception of the hearing is the central topic of ALL MACHINE. Why did you focus on the hearing? K. T.: Music is a very important part of my life, since years I have been singing in several punk noise etc. bands, and in the last 4-5 years my interest turned more into experimental and noise, industrial music. All Machine is not only a poetry book, it’s a collection of sound machines, noise “tables”, experimental music creatures and instruments. Next to this these machines are machines from my past, the factories I worked (gas, car, meet factory) and all these enormous objects produce amazing sounds, they should come in the book. Naturally there is a “literary interest” as well. During my studies, Robert Schneider’s Schlafes Bruder and the German avant-garde, dada Klangpoesie add something new to the written text, explore this field was a great experience for me, there was no question, that I wanted to go on that path. CHASED: I guess most people would say that machines are tools for people. Do you think that machines and humans are working and living together in a kind of „partnership“? K. T.: Machines are our hope, our better self. Changeable, variable, ready for develop. And we can also find our role in this relationship, for example the role of the “host”, the cabin or capsule. They are the hope for the cleaning, what we human beings “messed up”. It is a great question for all the humans, how to deal with the creatures of hours. Science and art gives lots of answers for this “partnership” like the robot wives in Japan or the new movie Ex machine, but the classics like Metropolis and also the industrial music give the answer I feel closer to. There is a hierarchy in all partnership, and being the patient host is our role now. CHASED: What makes human kind interesting for you? K. T.: Its function, its usability. And its sound. CHASED: When I did the research for this interview I thought to myself: How could I describe Kinga´s art? And then I had this image of a big hologram in my mind like in the Star Trek series – a 3 D version of all kinds of art. One form of art is not enough for you to express yourself, is it? K. T.: Yes, that’s right. 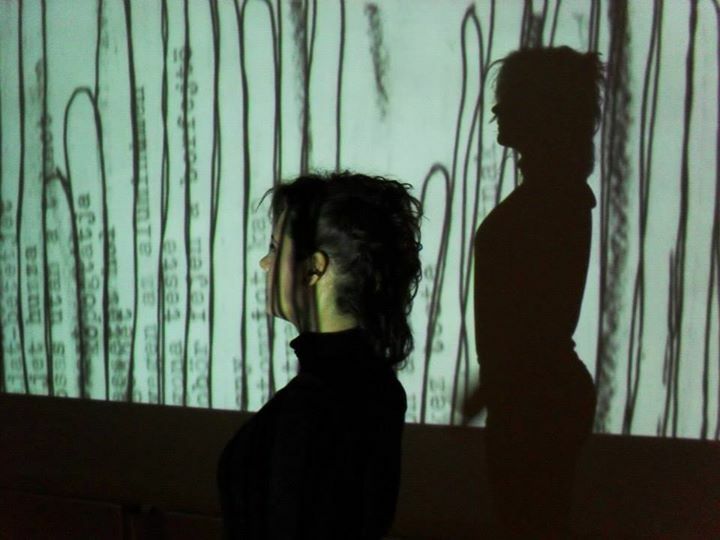 A couple of weeks ago I was involved in a Sound poetry festival, called Microfestival in Prague, where I met a very interesting but really precise terminology, “physical poetry” which describes just the way I understand the organism of the “text”. CHASED: What comes first – words, images, sounds? How would you describe your working process? K. T.: First the written language, but this is also not entirely true. I’m quite old fashioned, still have notice books papers, post its, which are full of graphics, words, a messy mishmash. Then the sound, the space and my part of it. More concrete: when I wrote my first book, PARTY, the form was already in my mind, I wanted to destroy, recreate and create children rhymes and talk about domestic violence and other taboos (queer, death, aggression, gender problems, social problems, politics) then I found the visual world, the contours of children drawings, without faces and expressions, and in the end I found the way to present, as a group performance with tape installation and sounds. CHASED: How does the audience respond to your performances? K. T.:When I began to perform in our duo with Gergely Normal experimental musician and fine artist our first concert was in Budapest on the Trash Festival. People named me a feminist rapper and a crazy schoolteacher, who should not be let to children. I was also called like “evil’s wife” because of the vocal techniques I use during my concerts. Many times happened that people had unpleasant feelings, but mostly they got moved. Our and later my solo concerts are not about having fun, more about to think, provoke, as you wrote “go under the skin” and face the hidden reality, meet the taboos. Although I also have to admit, children like it, I guess they feel the good aim or the good sake for this all. So I can not say, that people “like” my performances, but there is a big interest, and many times big discussions after that. CHASED: Your current project is about writings on walls, a so called „memento“. What is the idea behind it? K. T.: My current project, Wallwriting works with manipulation and language. This topic has also roots in my communication researches about verbal and nonverbal aggression and power taking with the language. A couple of years ago, when I began to travel more to different countries. The first I realised were all the time this messages on the walls, advertisements, graffiti, placates and so on. I began to look at the cities from the perspective of the messages of the walls. How “they” communicate, what path they want to lead us in which relationship they are with the current stories and news of the city. So I began to collect them, making photos, documentations, research a bit and look at the newest information, the main problems of the cities and began to write my stories about them. Nowadays wallwritings are the new fairy tales, the stories are on the walls, not in the books. So I try to create pictures about these cities according to this wallwritings, which are the mottos of the poems. Social activism is an important point in this project. Last autumn I was invited to Havirov, Czech Republic, where I wrote poems according to politic advertisement, with very critical points about how the local government want to destroy the railway station and other heritage buildings in the city. The local NGOs organised events and workshops for architects and artists, media was also involved, so in the end of our action, the railway station still exist. These are the moments, when art can have a “great function” in every day life, this is the other aim of the Wallwritings. CHASED: Earlier we talked about “Moonlight Faces”, a prose you are working on right now. Can you tell us something about it? K. T.: Moonlight faces is going to be my first prose, a kind of novel, included really small chapters-pictures, which make a kind of net. So it is not a linear story, more a circulation about body modification, machines and human bodies but from a completely different point of you than All machine. Here the illness is the change in the body, a diagnosis modifies the human being which needs to develop to be in contact with machines for surviving. This process is also a development, the body functions, the organs change from inside, which i try to present with these small and also very sensitive and personal texts with visuality, sounds and myself. The book is going to be published in the Netherlanden in English and also in Hungary next year.